Green seed in canola is a downgrading factor that causes more than $150 million in losses annually. But researchers at the University of Calgary hope to help reduce those losses with the identification of a gene that helps the de-greening process. Research by Marcus Samuel and his team has developed a bio-solution for green seed in canola. Green seed in canola is a downgrading factor that causes more than $150 million in losses annually. 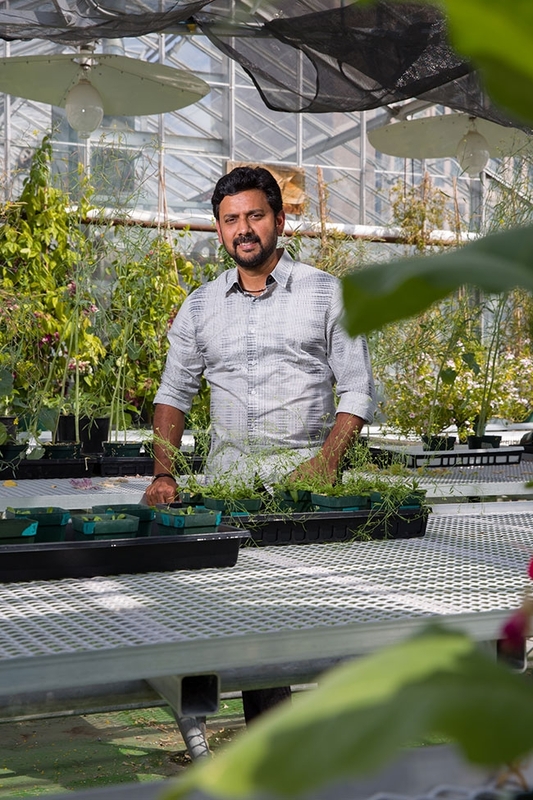 “Through some foundational research, we’ve come up with some novel technologies to help with the green seed problem,” says Marcus Samuel, associate professor at the University of Calgary. Normally, as canola matures, the green chlorophyll gradually disappears and at maturity, the seed is yellow and produces high quality oil. Samuel says studies in his lab have found that frost between 22 to 30 days after flowering results in the green colour becoming fixed in the seed, producing coloured oil with an unpleasant odour and reduced shelf life. Two per cent green seed is tolerated in Canada No. 1 canola and six per cent is tolerated in Canada No. 2 canola. “Frost can increase green seed [from] six to 20 per cent. Bleaching clays can be used during oil processing, but that is an additional cost,” Samuel says. Arabidopsis thaliana is a plant the scientific community has adopted as a model organism for research into plant biology. It is a member of the Brassicaceae family and closely related to canola. Although it is not an economically important plant, its traits make it a desirable plant for scientific study. Samuel and his colleagues worked on Arabidopsis to develop an understanding of how de-greening of seed works. They believed that if they could identify the de-greening pathways, the technology could be easily shifted over to canola. Abscisic acid is an important plant hormone that is part of the de-greening process. Samuel identified an abscisic acid insensitive 3 (ABI3) mutant gene that had a defect in seed de-greening, resulting in green seeds at maturity. By identifying this gene, he was able to prove the ABI3 gene controls two other genes – SGR1 and SGR2 – responsible for embryo de-greening. In the absence of the mutation in the ABI3 gene, the de-greening of seeds occurred naturally. Samuel then looked at what would happen if he added more of ABI3 into an Arabidopsis plant and subjected it to frost. By over-expressing the ABI3 gene in Arabidopsis, the plants were able to tolerate a frost better and continued to de-green the seed after the frost. In the Arabidopsis plants without the over-expression of ABI3, the green colour was fixed into the seed after a two-hour frost of -5 to -10 C per day at one, two or three days. Arabidopsis thaliana and brassica (canola) diverged 43 million years ago, but have 85 per cent gene sequence similarity. Samuel believed what his lab found with Arabidopsis could be easily applied to canola. The first step was to isolate the ABI3 gene out of Brassica napus (canola) germplasm and confirm that it worked the same way in Arabidopsis – which it did. The next step was to take the canola ABI3 gene and over-express it in canola. The team proved over-expressing ABI3 in canola worked very similarly in helping the de-greening process after a frost. The researchers came up with two separate transgenic platforms to allow breeders to move the ABI3 gene into canola germplasm. They also found the transgenic ABI3 gene in canola improved frost tolerance. Further research also confirmed the over-expression of the ABI3 gene did not change canola yield or alter the fatty acid profile of the oil. Oil content was marginally altered. The researchers also noticed ABI3 over-expression resulted in a thicker pod wall (replum) that was more resistant to shattering. Looking further into this finding, they found the pod structures were highly lignified, resulting in better shatter resistance, better frost protection for the seed and more resistance to desiccation after frost.